Chris Herbert, a 20+ year veteran of business and marketing, is a firm believer that business success, like life, is all about connections built. In this episode of Nimble’s Growth Hacking web series, Chris demonstrates how he’s been using Nimble to foster relationships that deliver high-value advancements to his entrepreneurial clients. Chris is the Founder of Mi6 Agency, a B2B marketing firm, as well as the Co-founder of Silicon Halton, a technology community that boasts over 1,400 members. Additionally, Chris also co-founded TechIgniters; an innovative accelerator for tech entrepreneurs. Through each of these ventures, Chris is creating connections that help clients grow their businesses. A visual business intelligence company called Maps BI, which happened to be associated with Chris’ tech community Silicon Halton, was incubating a new venture within their existing business in a cost-effective manner. Pursuing inexpensive growth hacking solutions, Maps BI approached Chris for assistance. Chris and the MapsBi team needed a go-to-market program that delivered a large base of potential customers that Maps BI’s new venture could quickly penetrate. The crew was able to identify three desired markets including telematics, or IoT for tracking and monitoring trucks, fleets and overall road safety. More specifically, Chris was looking for a telematics company in his network that tracks the movement of vehicles and records driver behaviors. Using Nimble’s advanced segmentation and relationship management features Chris was able to quickly build a network of contacts and make quicker connections with key target contacts companies that MapsBi wanted to partner with including the second largest telematics company in the world: GEOTAB. GEOTAB represented a target market of potential customers of 400,000 (they now monitor over one million) vehicles representing an estimated $24M market, if fully served, could generate over $9M per year revenue for Maps BI. With the right technology, Chris was able to identify and make prosperous and valuable connections. 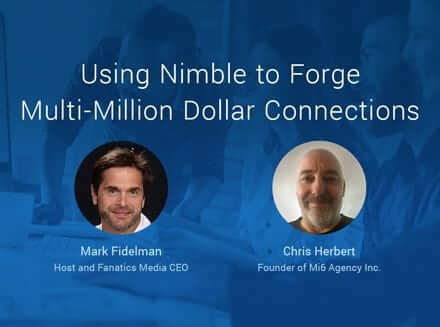 Nimble’s ability to build rich social business profiles for social contacts, segment profiles based on enriched fields and follow up via group messaging make Nimble an indispensable tool for Chris and his team for drumming up new leads and building more advantageous connections. Chris is a growth hacker extraordinaire. His methods for building communities and connections have been proven many times over. Comment here to connect with Chris about the growth hacks he shared in this interview. Be sure to also follow Chris on Twitter, or visit the Mi6 Agency website, for more powerful growth hacking tips, tricks, and advice. Previous Which Metrics are Best for Your Marketing Organization?